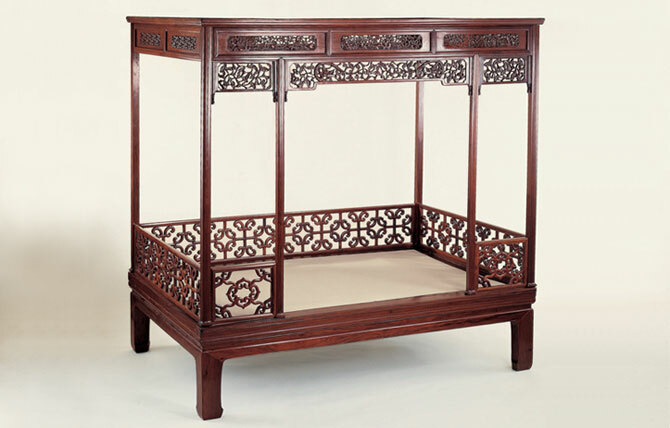 This Canopy bed blends elaborate carving and rich decorative elements with simple yet classic Ming design. Various combinations of the cloud motif, integrated harmoniously with delicate joinery, compose the design of the front, side, and back railings. The canopied lattice, made from openwork ornamental panels, is artistically carved with geometric designs on the sides and back, and peaches, peach blossoms, peonies, and plum blossoms on the front. There are three additional openwork panels beneath the front canopied lattice carved with floral scrolls and confronting dragons. The six posts supporting the superstructure have concave moldings with beaded edges on the front and sides. The secondary wood used on the roof is elm with Huanghuali on the outside frame. The style, craftsmanship, and type of lacquer traces remaining suggest that this bed was built for a very wealthy person from Suzhou District. This bed has been published by Sarah handler in Classical Chinese Furniture in the Renaissance Collection, Orientations, Jan 1991, p. 47, fig. 9 and in The Canopy Bed in the Light of Chinese Architecture, Orientations, Jan. 2002, p. 25 fig. 1. Also, see Wang Shixiang and Curtis Evarts, Masterpieces from the Museum of Classical Chinese Furniture, p. 20, no. 10. This Bed is now on display at the Guanfu Museum, Beijing.